Twitter has unveiled a new emoji for the 14th Malaysian General Election, featuring a marked ballot above the Malaysian flag, which is shaped to resemble the ballot box. 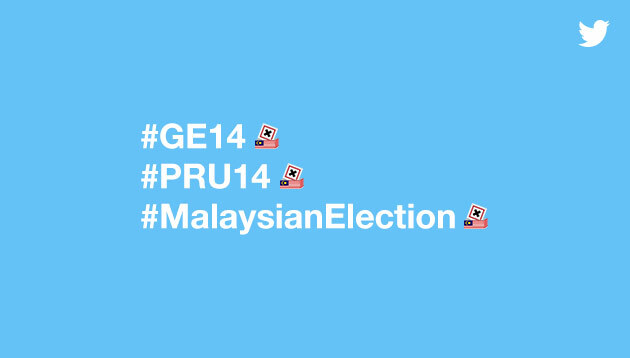 The emoji appears when the hashtags #MalaysiaElection, #GE14 or #PRU14 are used in the tweet, and is available until 16 May. News of emoji surfaced when a netizen spotted it and tweeted the hashtags. This is not the first time Twitter has created an emoji for elections. Last September, it revealed a new emoji dedicated to President Halimah Yacob, following her presidential victory. The Twitter emoji design was created in Yacob’s likeness, with Singapore’s national colours for her tudung (headscarf in Malay). Emojis were also created for the 2016 US election and European Union referendum. In a statement to A+M, Twitter’s spokesperson said the platform is “the best place to know what’s happening in your city, country or community, and the world”. “To encourage more real-time Twitter conversations among Malaysians on the upcoming elections, Twitter has launched a special election emoji,” the spokesperson added. Recently, Twitter revealed that its international ad revenue increased 52%, led by strength in the Asia Pacific region. Ned Segal, Twitter CFO, said in an earnings release that the company total advertising revenue was at US$575 million, an increase of 21% year-on-year (YOY). Meanwhile, owned and operated (O&O) advertising revenue increased by 28% YOY at US$533 million. Non-O&O advertising revenue was at US$42 million, a decrease of 28% year-over-year driven by a US$23 million YOY decline from the deprecated TellApart product, which did not have any revenue in Q1. Excluding TellApart, non-O&O advertising revenue would have increased 18%, the statement added. This comes despite recent research from YesMore Agency stating that 42.3% of alcohol brand had not posted at all in the past month, 32.4% had not posted within the past three months and 20.7% had not posted on Twitter in a year or more. This included accounts from brands such as Diageo, Pernod Ricard, Bacardi, Campari, Brown Forman, Beam Suntory and William Grant & Sons. The company will differentiate its payment system from its competitors like Octopus Card by putting a focus on its unique "payment.. He joins Exponential from Outbrain, where as head of account strategy he was part of the original team that kick- started the busi.. Grab's spokesperson told Marketing that the move is to enable users to enjoy a more seamless experience. ..